These manikin hands are a very useful tool for visualizing the basic volumes of the figure. 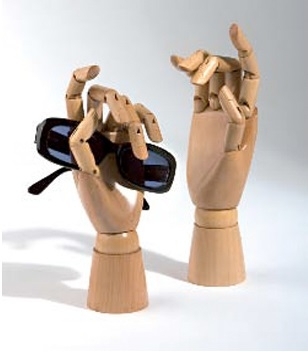 Articulated mannequin wood display hands are ideal hand displays when it comes to visual merchandising. Our pair of articulated hands have fully articulated joints which mean that each hand is fully poseable. Height: 25cm. This set includes one left and one right light wood hand. These articulated hands can be used with or without a display stand. Stands not included.